A rooftop farm in the middle of New York City, growing a million pounds of produce every year, would have been unimaginable a short time ago. It is now a reality. There are some amazing trends emerging in a variety of farming operations that will affect where and when your produce is grown. Six key forces are driving those trends, and they are creating amazing business opportunities. Growing produce in South America and trucking it to locations in North America requires a huge amount of energy. The United States Department of Agriculture (USDA) is helping to fund improvements in agricultural energy efficiency, as well as conversions to renewable energy systems, that will make regional growing more affordable. Cozy Acres Greenhouse in North Yarmouth, Maine, utilized the USDA program to create its signature line of produce -- described as “Zero Emission” products. Cozy Acres' produce is grown in a greenhouse that uses electricity created from the sun and heat from a geothermal system. When it distributes its products to local restaurants and farmer’s markets, their carbon footprint is negligible. Year-round grow operations were unheard of in northern climates due to the short daylight of winter. The use of supplemental grow lights tended to be expensive and limited profit potential. New LED grow lights have dramatically reduced the energy demands of a greenhouse operation and make year-round operations more profitable. Locally-grown food was the No. 1 choice on the top 10 list of menu trends for 2014, according to the National Restaurant Association. The Chipotle restaurant chain, in recognizing this trend, continues to provide more locally grown, organic food for use in its food operations. This trend is giving local growers a huge advantage. The farm-to-table trend can be summed up in one word – FRESH! Picking an ear of corn when it’s at peak ripeness and immediately roasting it on a grill and savoring its unique flavors is an unknown experience for most urban shoppers. Their corn was probably picked many days prior to purchase, and the peak flavor is inevitably lost. Now, even in the middle of New York City, fresh, farm-to-table food products are available. Farm-to-table is a growing trend with no end in sight. Food that is picked, processed and served all in the same area is a trend that is economical and profitable for farmers as well as farmers markets and restaurants. In the past, the open spaces needed for farming were nonexistent near the city. Local growing operations were not possible, and produce needed to be trucked in to local markets. With the changes in our economy, many towns have large former industrial spaces or warehouses sitting empty. Technology now makes turning that space into a farm possible with a minimum of site changes. 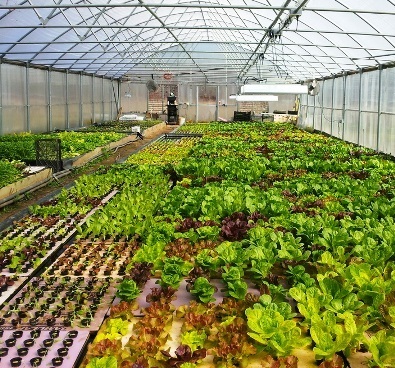 St. Paul, Minnesota, converted a former brewery into an organic farm capable of turning out tons of produce per year. There are some amazing trends emerging that will affect where and when your produce is grown. Led by changes in technology and a growing awareness of sustainability, the forces listed above will drive trends that will affect your food choices and will influence your produce buying habits in the very near future. The trends have also created a new word that best sums up the movement -- locavore! Kerry Kilpatrick is the Social Media Director for The Energy Alliance Group of Michigan. He enjoys highlighting the amazing stories that result when businesses implement energy saving strategies and embrace renewable energy innovations. An energy philosophy best summed up by the phrase “reduce then produce."